Implement plugin framework (and plugins) for collecting data about runtime job execution. Overview: Implement plugin framework (and plugins) for collecting data about runtime job execution. A contrived multi-core example demonstrating job runtime resource usage statistics. Configuration: An example job_metrics_conf.xml.sample is included that describes which plugins are enabled and how they are configured. This will be updated for each new plugin added. By default no instrumentation or data collection occurs - but if a job_metrics_conf.xml file is present it will serve as the default for all job destination. Additionally, individual job destinations may disable, load a different job metrics file, or define metrics directly in job_conf.xml in an embedded fashion. See comment at top of job_metrics_conf.xml for more information. CLI runner - CLI runner needs to be reworked to use the job script module anyway so GALAXY_SLOTS works - the LWR version of the CLI runner uses the job script module - this work just needs to be back ported to Galaxy. If a job_metrics_conf.xml is present and some jobs route to the above destinations - the jobs won't fail but annoying errors will appear in the logs. Simply attach a metrics="off" those these specific job destinations to disable any attempt to use metrics for these jobs and disable these errors. More complete documentation on each plugin can be found in job_metrics_conf.xml.sample. core - The core plugin and captures the highest priority data - namely the number of cores allocated to the job and the runtime of the job on the cluster and has no external dependencies. These two pieces of information alone should provide a much clearer picture of what Galaxy is actually allocating cluster compute cycles to. env - Record runtime environment variables (specific or all) based on configuration. Collectl (http://collectl.sourceforge.net/) is a powerful monitoring utility capable of gathering numerous system and process level statistics of running applications. The Galaxy collectl job metrics plugin by default will grab a variety of process level metrics aggregated across all processes corresponding to a job, this behavior is highly customiziable - both using the attributes documented below or simply hacking up the code in lib/galaxy/jobs/metrics. Warning: In order to use this plugin collectl must be available on the compute server the job runs on and on the local Galaxy server as well. Attributes (the follow describes attributes that can be used with the collectl job metrics element above to modify its behavior). saved_logs_path: If set (it is off by default), all collectl logs will be saved to the specified path after jobs complete. 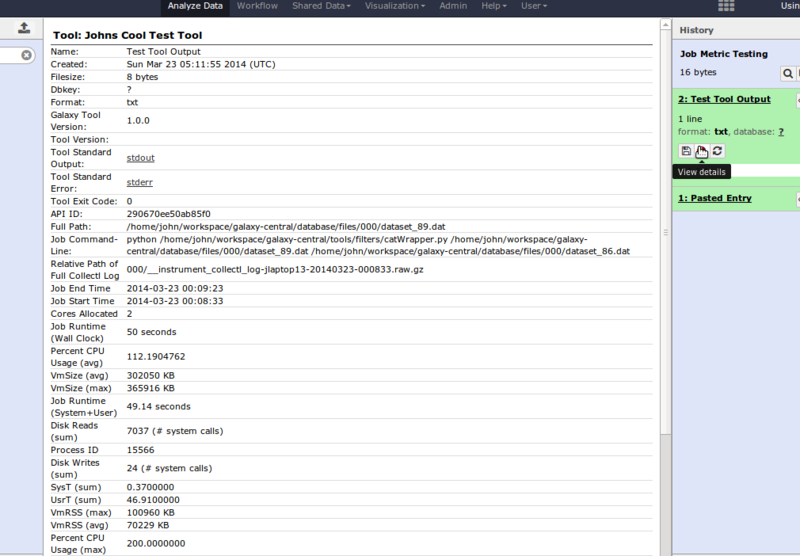 These logs can later be replayed using collectl offline to generate full time-series data corresponding to a job run. saved_logs_path these files can be played back at anytime. Available subsystems - process, cpu, memory, network, disk, network. (Default process). process_statistics: If summarize_process_data this attribute can be specified as a comma separated list to override the statistics that are gathered. Each statistics is of the for X_Y where X if one of min, max, count, avg, or sum and Y is a value from S, VmSize, VmLck, VmRSS, VmData, VmStk, VmExe, VmLib, CPU, SysT, UsrT, PCT, AccumT WKB, RKBC, WKBC, RSYS, WSYS, CNCL, MajF, MinF. Consult lib/galaxy/jobs/metrics/collectl/processes.py for more details on what each of these resource types means. Defaults to max_VmSize,avg_VmSize,max_VmRSS,avg_VmRSS,sum_SysT,sum_UsrT,max_PCT avg_PCT,max_AccumT,sum_RSYS,sum_WSYS as variety of statistics roughly describing CPU and memory usage of the program and VERY ROUGHLY describing I/O consumption. That would be incredibly useful for us, we need job runtime statistics here at CRS4. Please go ahead! Thanks - I will merge after release Monday. Also thanks for agreeing to make CRS4 my beta tester :).